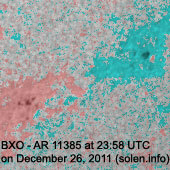 Last major update issued on December 28, 2011 at 06:45 UTC. 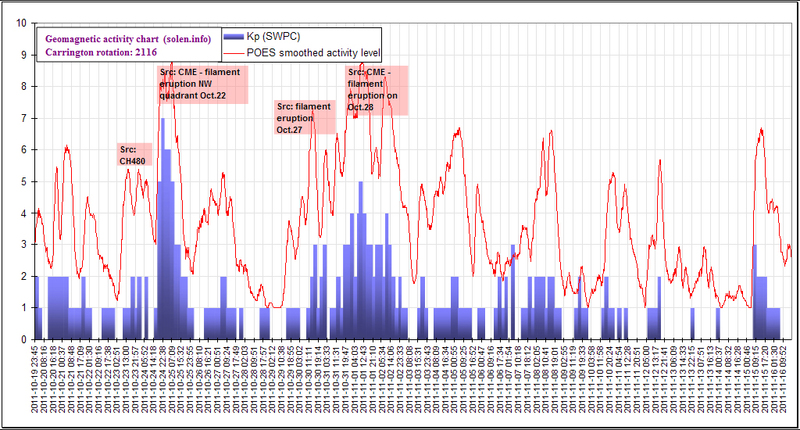 The geomagnetic field was very quiet on December 27. 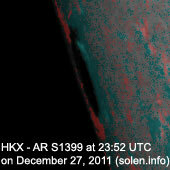 Solar wind speed ranged between 271 and 344 km/s. 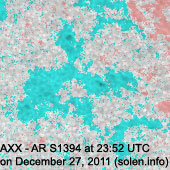 Solar flux measured at 20h UTC on 2.8 GHz was 140.3 (decreasing 3.7 over the last solar rotation). 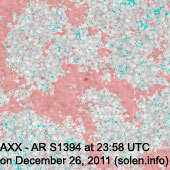 The planetary A index was 1 (STAR Ap - based on the mean of three hour interval ap indices: 0.6). Three hour interval K indices: 00000001 (planetary), 00001221 (Boulder). 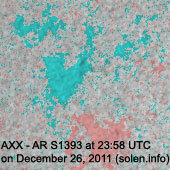 Region 11380 [S20W56] is a complex region with significant polarity intermixing. 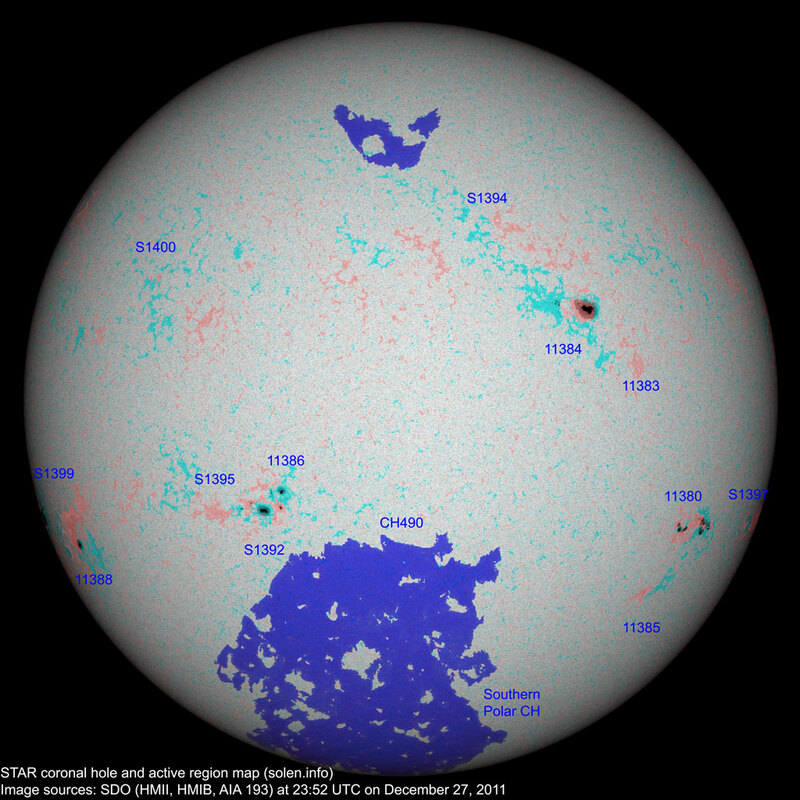 There's at least one minor magnetic delta structure. M class flares are possible. 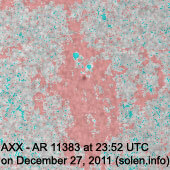 Note that SWPC has this as region 11387. 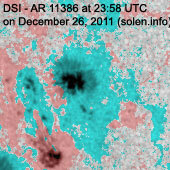 Flares: C3.8 at 08:22, C4.0 at 09:23, C6.2 at 12:07, C2.5 at 18:36 UTC. 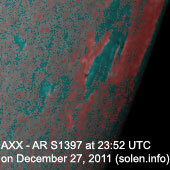 Region 11383 [N05W38] decayed slowly and could soon become spotless. 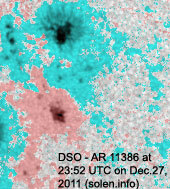 Region 11384 [N13W28] decayed in the trailing spot section while the large penumbra took on an asymmetrical shape. 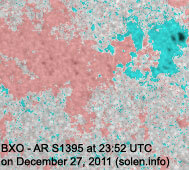 Region 11385 [S32W49] lost the leader spots and could soon become spotless. 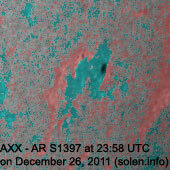 Region 11386 [S16E18] displayed no major changes. 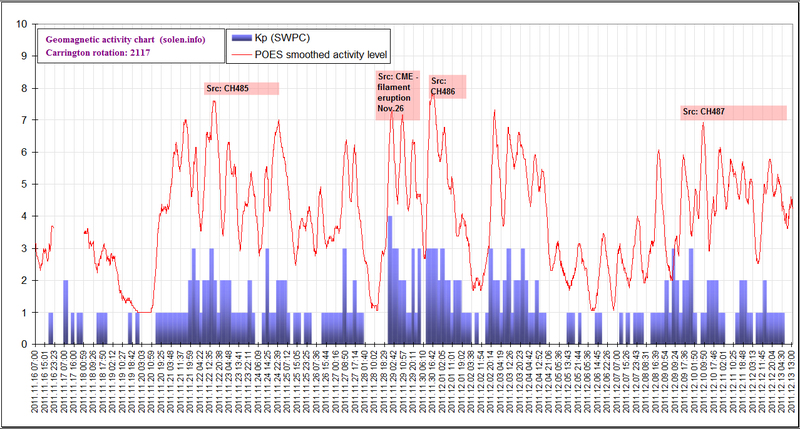 Note that SWPC includes regions S1392 and S1395 in this region. 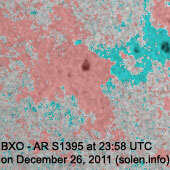 Flare: C8.9/1F at 04:22 UTC. 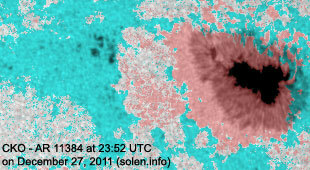 This event was associated with at least a partial halo CME where quite a bit of material was hurled northwards. 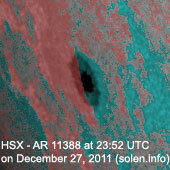 New region 11388 [S23E69] rotated into view at the southeast limb on December 26 and got an SWPC number the next day. 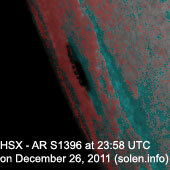 [S1399] rotated into view at the southeast limb on December 27. Location at midnight: S19E84. 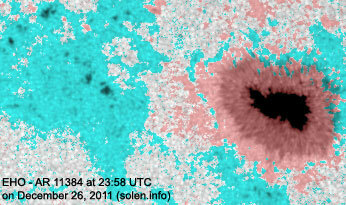 Flare: C6.7 at 22:26 UTC. December 25: A partial halo CME was observed early in the day in LASCO images in association with a filament eruption in the central northern hemisphere. 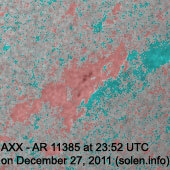 There's a 20-30% chance of a flank impact from this CME sometime on December 28. 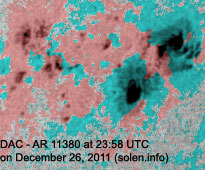 A CME was observed in STEREO images after the M4 event in region 11380. 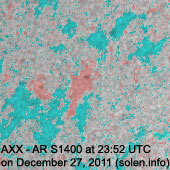 This CME could reach Earth sometime between late on December 27 and late on December 28 and cause unsettled to major storm conditions. 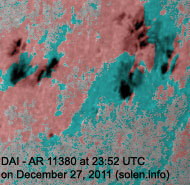 December 26: At least a partial halo CME was observed after a filament eruption across the central meridian near region 11384. 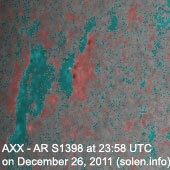 This CME could reach Earth on December 29. 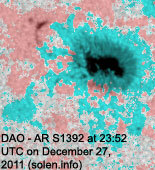 December 27: At least a partial halo CME was associated with the C8 flare in region 11386 early in the day. 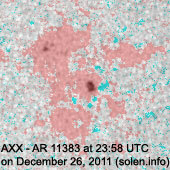 This CME is fairly slow and could reach Earth on December 30. 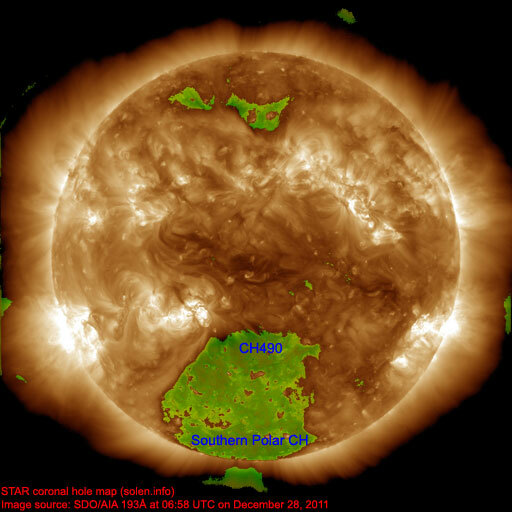 A large extension (CH490) of the southern polar coronal hole will rotate into a potentially geoeffective position on December 26-29. The geomagnetic field is expected to be quiet to minor storm on December 28-31 due to CME and coronal hole effects, occasional major storm intervals are possible.